On the TQI Diet, extra virgin olive oil (EVOO) is the dominant oil, the one we use most frequently and in the greatest amount. Some students beginning to use EVOO have a bit of trouble finding one they like. Many are accustomed to the neutral taste of refined oils and find that some olive oils have a strong taste that they perceive as unpleasant. Others worry that it is said to be difficult to find a “real” EVOO given a claimed wide spread adulteration of these oils. Exploring olive oil can be quite an interesting journey and I highly recommend the book “Extra Virginity: the sublime and scandalous world of olive oil” by Ted Mueller as an introduction to this fascinating world. This is the book that brought the issue of adulteration to the public’s attention back in 2011 and there are still some problems in this regard. Lawsuits are currently pending in the U.S. claiming fraud against Salov North America that produces Filippo Berio Olive Oil Brands and Safeway’s Select Brand of olive oil and against Deoleo USA, Inc., the manufacturers of Bertolli & Carapelli brands. Italy is also investigating seven companies (Bertolli, Santa Sabina, Primadonna, Antica, Carapelli, Coricelli and Sasso) for selling a lower grade oil as EVOO. Nonetheless, great progress has been made in certifying true EVOO and it has become quite, quite easy to locate a wide variety of different types of excellent oils. In the US, we have certification done by the California Olive Oil Council (http://COOC.com) and the North American Olive Oil Association (http://www.naooa.org/sealprogram) guaranteeing that the certified olive oils have been tested and are what they claim to be. There are European certifications of origin (POD or protected designation of origin) that may be labeled as D.O.P. (Denominazione Origine Protetta) in Italy, D.O. (denomination of origin) in Spain, and A.O.C. (Appellation d’Origine Controlée) in France. As well there are competitions such as the annual New York International Olive Oil Competition where more than 700 types of EVOO from 25 countries are judged by an international panel of experts. (http://www.bestoliveoils.com/). In addition, many companies are beginning to test and report on the quality of oils they sell. For instance, this link provides an interesting evaluation of Trader Joe’s olive oils:http://www.traderjoes.com/digin/post/guide-to-evoo. Once you realize that you can source the real deal, the next step is to find an olive oil with a flavor that suits you. There are hundreds of varieties of olives that are harvested at different times and blended in different ways giving rise to a near endless variety of flavor choices ranging from mild to pungent and bitter. What makes EVOO such a healthy oil are its polyphenol antioxidants and the oils richest in these antioxidants will have a pungent, bitter flavor that can be perceived as a burning at the back of the throat and a pepperiness. Over time, as you become more familiar with olive oil, you may well come to prefer these stronger oils. In the mean time, however, you may be happier with more delicate oils. As well, as even the strongest oils age a bit, their polyphenol content drops and they develop a milder flavor but are still healthy oils. If you do prefer a delicate flavor, there are many sites that will help you find one. For instance, http://lettherebebite.com/in-store-guide/olive-oil/ gives a good summary of different grades and types of olive oil. They identify some oils with a more delicate flavor such as those made from arbequina, leccino, sevillano, and taggiasca. You could make a list of those olives and perhaps go to http://www.cooc.com/# and click on “seal certified” in the side bar and pick out olive growers that produce those varieties. By going to the various websites of these olive growers you can read more about their oils. This can be a bit overwhelming at times but is ultimately fun. Or you could go to http://www.bestoliveoils.com and search for an award winning oil made from one of those olives. Once you have a list of oils to try (or even if you don’t) visiting one of the many places that offer olive oil tastings can be a fun way to pick one. Simply search online for “olive oil tasting” and your zip code. This site lists a few tasting locations in Seattle http://seattle.cbslocal.com/2012/06/04/ … n-seattle/ but farmer’s markets and many grocery stores also offer tastings in almost all communities. Or do what I did: Just buy a bottle that sounds good and jump in to the world of EVOO. With time you may eventually want to immerse yourself in the world of EVOO and at that point one option is to sign up for an an online olive oil school – they will send you samples to test and taste as part of the course. (See e.g., http://www.oliveoilschool.org/.) That is something I hope to do eventually. Of course, you may not want to use your most expensive olive oil in cooking. The food guru Harold McGee did his own taste tests and found that the flavors of high-quality EVOOs are erased with heating. (http://www.nytimes.com/2010/11/17/dining/17curious.html?_r=1). So when cooking with EVOO it can make sense to reach for a less expensive bottle, at least as far as flavor is concerned. But do not follow McGee’s advice and cook with a refined oil instead. As oils are refined, their antioxidants are destroyed and trans fats begin to form. In McGee’s taste tests, they tasted the cooked oils. 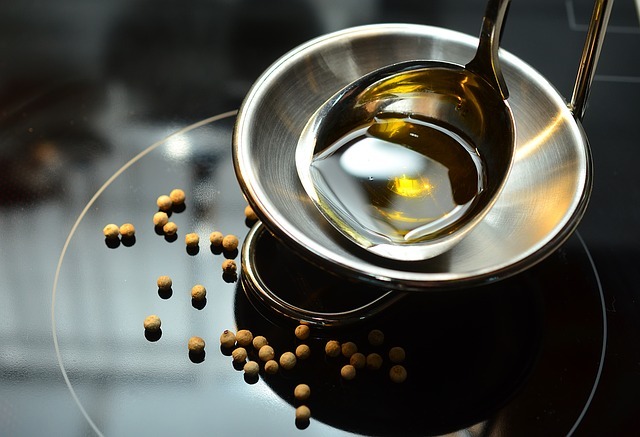 You are not going to eat the cooked oils, you are going to eat foods cooked in EVOO. Remember, the antioxidants in EVOO combine with and protect your food from heat damage. (https://tqidiet.wordpress.com/2014/08/07/go-ahead-cook-with-your-good-olive-oil/.) I believe there are health benefits to be gained if we cook with exceptional quality, antioxidant rich EVOO, so if you can afford to, use them. If not, use a less expensive but antioxidant rich EVOO to cook with and save those young, extra special bottles for drizzling on your food, raw or after it is cooked. For instance, a drizzle of a special oil and some salt on a baked potato can be quite a taste experience – far superior to butter in my opinion. This entry was posted in chemicals, Food and tagged adulteration, cooking, evoo, flavor, olive oil, polyphenols. Bookmark the permalink. Thanks for this, Kathy! So good to hear from you. Really appreciate knowing a bit more about how to choose good EVOO. I’ve read from multiple sources that the properties of olive oil change for the worse when heated and should not be used for cooking – so I’ve been cooking with avocado oil which is rather expense. Are you able to elaborate on that at all? The last reference above (https://tqidiet.wordpress.com/2014/08/07/go-ahead-cook-with-your-good-olive-oil/) goes into that issue in pretty good detail: The antioxidants in a good EVOO quell free radicals generated as you heat your food and, for instance, reduce the formation of carcinogenic heterocyclic amines when cooking animal products. While the oil left in the pan may not taste or be good for you, the food cooked in it benefits. As well, the high heat avocado oils most use are already refined, have little-to-no antioxidants but do add trans fats to the mix. Not a great choice. Hello Kathy, thank you for your blog. I’ve just been introduced to ‘The Abascal Way’. One thought about olive oil, is that nowadays in the US there are many local producers making high-quality olive oils. Since I live in northern California, my recommendation is Apollo Olive Oil made in the Sierra Nevada foothills. They press using a vacuum press technique that was invented and perfected in Italy and prevents oxidation during pressing. This method allows the polyphenol count to remain high. Also, my wife and myself have started using coconut oil to cook with. The high heat tolerance means we don’t consume burnt oil. Only raw, cold-pressed virgin coconut oil. Dr. Bronners is a very good brand. At first I thought that my food would taste like coconut, but the oil does not leave a taste on the food. Dee-lish! Glad you like the blog and thanks for the tip on Apollo EVOO. Do be careful cooking with coconut oil. While refined coconut oil has a high smoke point, raw does not. Its smoke point is about 350F and, in contrast to EVOO, has far fewer antioxidants to protect your food from the heat. One study found that EVOO has some 50 times more antioxidants so I tend to cook with EVOO and use a good quality coconut oil after cooking where I want the mouth-feel of butter or the flavor of coconut oil. Thank you for this resourceful article! I’m curious about flavored EVOO… specifically my favorite with these ingredients: extra virgin olive oil, natural flavors of oils and essences extracted from lemons. Would you give this a thumbs-up or a thumbs-down according to the TQI way? Or, is more information needed? I’ve seen EVOO infused with lemons, that is, real lemons are soaked in EVOO. Natural flavors of oils and essences extracted from lemons are much greater unknowns, so without more information, I’d give them a thumbs down. Your blog is exceptional, thanks from all my cells! There seems to me to be just one (very important) oversight as to EVOO’s here, however: Mustn’t we Also choose ORGANIC in the case of this central meal ingredient? I am confused a bit that no mention was made to this issue/purchasing decision. With humble thanks, I look very much forward to your nutritionist take. WouPS: Keep up the excellent blogging, your ‘community service’ here is helping enlighten more of us than you know. WheWe cover toxins including pesticides in detail in class and then let each individual decide whether to organic fully, partially, or not at all. Olives generally are quite sturdy and are not a heavily sprayed crop although they use herbicides and in Spain have begun releasing GM insects in the orchard. There may be other advantages to organic as well but most important will the using a good quality oil.